Registration is for new students who have completed enrolment at college. Please do not attempt to register until you have been instructed to do so. Along with approximately 900+ other adults in the West of Scotland this year, you have taken a very positive step towards your future goals by enrolling on a SWAP Access programme in your local college. We understand that such a decision is not taken lightly; it represents a big change in your lifestyle and will require you to make sacrifices in terms of time and effort, not only for yourself but for your friends and family, as well. Dealing with finances, learning to study again, juggling multiple responsibilities such as work, relationships, perhaps parenthood and even (dare we say it) maintaining some sort of social life...? Well, let's just say that you certainly won't lack for "challenges" this year! On the other hand, you will also have tremendous opportunities to learn, make friends, discover your true vocation and gain a qualification to ensure your progression to an HN course at college or a degree programme at university. This section of the web site is devoted to those who are currently enrolled on a SWAP programme. The navigation links to the left are in the form of a timeline. Check back regularly to get up-to-date information about SWAP student tasks and events, including Preparation for Higher Education work and opportunities to visit universities for Study Skills Days. 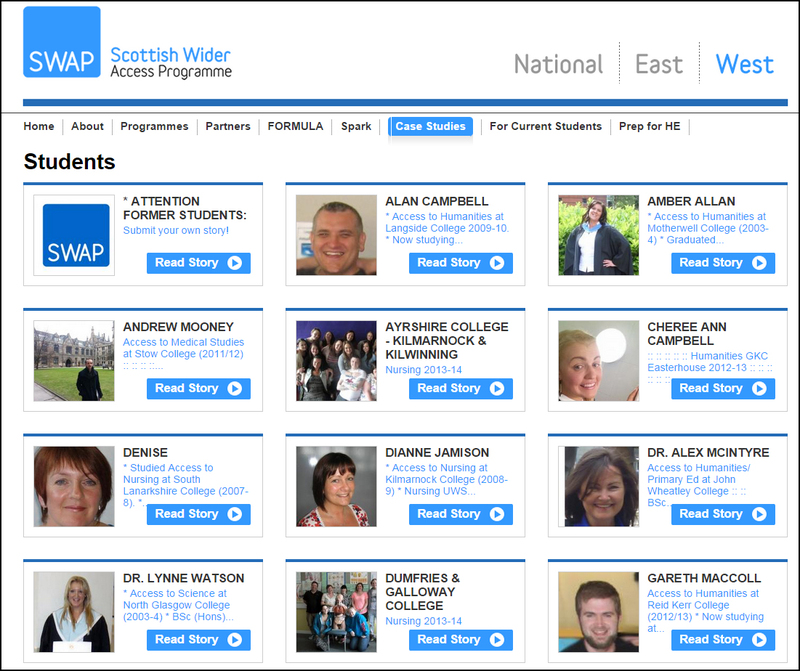 Your college tutor should be your first contact for questions about the SWAP programme or your course, but you are always free to contact the SWAPWest office on 0141 564 7206 for impartial advice and support. Former SWAP students know exactly what it's like to return to education after a long time, to feel overwhelmed at times, but also excited about moving on to university. They know you have questions and they've volunteered to answer them! The Network can be reached via a "closed group" on Facebook. To join, visit www.facebook.com/groups/743396469057202 or send an email to SWAP requesting an invitation. To faciliate your admission to the group, PLEASE ANSWER THE QUESTIONS YOU ARE ASKED! After you join, you will be able to post questions in the group.